The handbook, Starting and Running a PAT Testing Business by Seggy T. Segaran, is an extremely useful guide for experienced PAT testing business owners and is an invaluable resource for new PAT testing business start up owners. It offers itself as a comprehensive guide covering all aspects of starting and running a PAT testing business. With PAT testing being an attractive opportunity to run your own business and earn a good income, many people look for guides like this to supplement their PAT testing training. 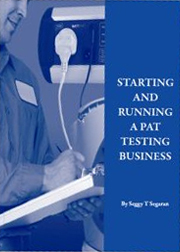 Seggy T. Segaran, an industry expert, has put together this handbook for PAT tester business start ups, which covers all aspects and questions that may arise from starting a new PAT testing business. The guide takes you through all aspects of business and especially things that may not have been considered such as, marketing, pricing, customer service and bookkeeping. This handbook encourages the reader to think about all the background aspects that aid the successful running of a PAT testing business. The PAT testing handbook is aimed at people setting up and running a small, local PAT testing business that is able, or will be able, to generate a good starting income. The useful appendix at the back shows examples of leaflet production, press releases, quotes, invoices, statements and overdue letters. All of these are essential for a business and all require different skills, this guide sets out exactly how to do this, allowing you to successfully build your business by utilising all of the resources at your disposal.